Reece has been making good improvements over the last couple of days. He is on a regular flow nasal cannula, sitting just above room air as far as his flow. He has been without fevers for the last day or so. We have been out walking and doing wagon rides, which is helpful, but his activity level needs to increase to help out his whole body’s functioning. Yesterday, the nurses noticed that he had an irregularity in his heartbeat. They see this often in kids; they monitored his heart all day and did an EKG to check things out. The doctors were not concerned, but will monitor it every so often to make sure is not increasing in frequency. It is likely due to the amount of drugs he is taking right now. A doctor who happens to specialize in that area was the nighttime doctor last night, which worked out perfectly for a consultation. She said based on where the irregularity happens in regard to his heartbeat pattern, she is not concerned. She had the leads taken off for monitoring. All I can say is…good. Reece has been dealing with a flare up of his skin GVHD. They increased his dose of steroids so he is back to receiving them twice a day. As it did the first time he was put on the steroids at twice a day, it is messing with his sleeping habits. His evening steroids make him wakeful at night, which then makes him nap throughout the day. His rash seems to be holding steady–we need to see improvement. There is still some wiggle room to increase the dose, but we don’t want to go there. If the rash does not subside, the last resort would be to wipe out his T-cells, which would make him even more immunosuppressed–leading to even more vulnerability to infections. Additionally, his T-cells are showing 100% donor, so we don’t want to have to wipe out any donor cells if we don’t have to. One other interesting tidbit of info we learned this week is that according to his latest blood engraftment study, his blood composition still pretty split between the two cords. It is more uncommon the farther we get out of transplant for one cord not to start dominating. We’ll see what happens…he’s still 100% donor, though! It would be awesome if the rash became controlled, the oxygen could be weaned off completely, and the fevers would stay away. We would actually have passes to go home intermittently throughout the day as a way to get ready for the d-word. It would be such an encouragement for him to be able to get out of here for a few hours. It’s a good goal to have in mind. Best to all of you and thank-you! Here’s a quick update on how Reece is doing. Overall, I feel positively about his progress. Later Monday, Reece’s rash flared up, so he is back on steroid creams. The flare has prevented his IV steroids from starting to taper off. Because his steroids haven’t started to taper, he still doesn’t have relief from his insulin needs. He is still fighting fevers–although low-grade at this time. Blah. It’s all connected. On a positive note, Reece has been doing well with his oxygen. Yesterday, they were weaning down his pressure (basically the amount of air that is forced into his lungs as he breathes on high flow oxygen) and his oxygen was only at 30% (we breathe room air at 21%), which is the lowest they usually put the O2 setting. Overnight, he was able to stay on high flow, versus going on BiPAP. They did turn up both the pressure and O2, to assist with his nightime breathing rate (everyone breathes more shallowly while asleep). The plan today is to continue to wean down the pressure with a goal of 8-10 liters (he’s on 12 liters right now). To put it in perspective, when he was on oxygen the first time, the pressure only went up to 8 liters, per the machine’s settings. So once he can comfortably sit at 8 liters of pressure, he can go down to a lower pressure nasal cannula. The pressure from the air that he is breathing is creating some build-up of air in his stomach, so his stomach appears distended (Reece and I have a similar profile right now). Hopefully, as the oxygen is weaned, this will resolve itself. When he is not resting, Reece has been more talkative and interactive. He has been able to take wagon rides again and has been walking during parts of the outings. He has been eating some and drinking lots of milk. Yesterday, he ate macaroni and cheese! Six glorious bites. He’s doing well and I really hope I don’t regret posting early in the morning, because things tend to change about 20 minutes after I put up a blog post. I know he is getting back to his old self, because the birthday cards and gifts from his preschool classmates and friends were a big hit! Thanks to all of you who have sent Reece things, from his preschool classmates and teachers, to BSF teachers and buddies, family and friends, acquaintances, and total strangers. I have not sent out a single thank-you card (yet), but it isn’t because we aren’t thankful. Those things are so helpful and appreciated and Reece has received much encouragement in hearing from his pals. We are loved. Thank-you! It was definitely not the birthday weekend that I had envisioned when we were admitted to the hospital. We had all thought he would be home and feeling much better than he actually did. 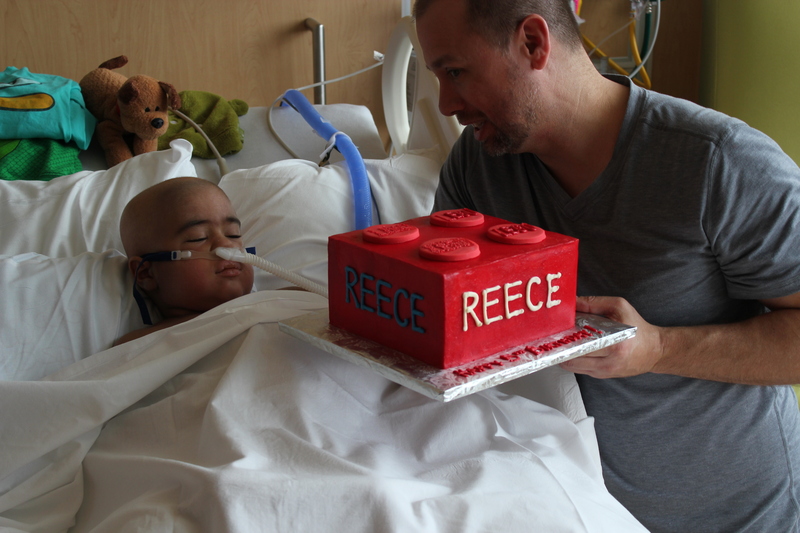 Still, Reece did have a Lego-themed birthday cake and party, including singing and presents from the nurses and doctors, and many well-wishers. He was battling a fever all day on Saturday, but held his own despite not feeling his best. He had many smiles throughout the day and that was enough to make my day. Yesterday he fared a little better temperature-wise. He still was lower in energy. It was hard to watch him have his birthday in the hospital; he deserves to be having fun, doing 5-year-old things. We need to get him out of here. It’s hard for me to post pictures of Reece right now, because I feel so protective of him. But I am posting a picture of him with his cake. You can’t tell by his face so much in the picture, but he thought is was pretty cool. We never did cut into it, as he didn’t feel up to eating it. When we get home, we will do another big party and a bigger cake and lots of goodies. Just so you know, Reece’s hair is growing back, but one of the drugs he is on to suppress his immune system (in order to avoid GVHD–all allogeneic BMT patients receive this drug) makes the kids grow hair all over their bodies and especially thick hair on their faces. These little guys have unibrows and sometimes mustaches and other facial hair. When he is off of that particular drug, the hair that is not normally thick on his face and body will fall out, leaving his regular amount of hair behind. His face is puffy due to the steroids he has been on for GVHD and the hemorrhage. They are starting the steroid taper tomorrow and it will last for about 10 weeks, assuming his rash doesn’t flare up. He will get back to looking like his normal self. He is a cutie despite all the weird side effects of the drugs. I have several different posts running through my mind–things that are probably worth writing about, but I haven’t been able to pull them all together mentally to make them sound coherent. I can, however, sum up how I am feeling in four short words–I am freaking out. I am 34 weeks along as of yesterday. I would be shocked if I went to my due date; it could happen, but it’s not likely. That gives us about a month until the baby is born. I can not fathom what it would be like to give birth while Reece is still hospitalized or how we would manage a child in the hospital, a busy two-year, and a newborn. I see our best case scenario for Reece’s discharge being two weeks out. No one at the hospital is even to the point of mentioning it, so things would really need to come together. His lungs need to repair, he needs to be fever-free, and he needs to take his meds orally. This also assumes that he doesn’t catch any further illnesses. If anything else comes up, it means more time in the hospital. This whole scenario is getting exhausting to watch and live through. I can not envision our lives ever getting back to normal. I have had some distinct feelings about things turning around. I’m not going to weigh in on what that will look like, but my gut feelings have been pretty accurate all along. I have a gut feeling that we will be going home sooner rather than later. The only reason I am putting that out there is that I feel like this today, right now, this moment. As I was getting ready this morning, a verse came to mind from 2 Timothy 1:7, “God doesn’t want us to be shy with his gifts, but bold and loving and sensible.” I had only ever considered this verse with spiritual gifts and didn’t apply it to what I consider some of my most precious gifts in life–my kids. This is what I plan on focusing on for the next several months in an effort to keep persevering. Otherwise, my crisis tendency is to bury my head in the sand like an ostrich. That isn’t an option–it only ignores the problem while isolating my kids and family. 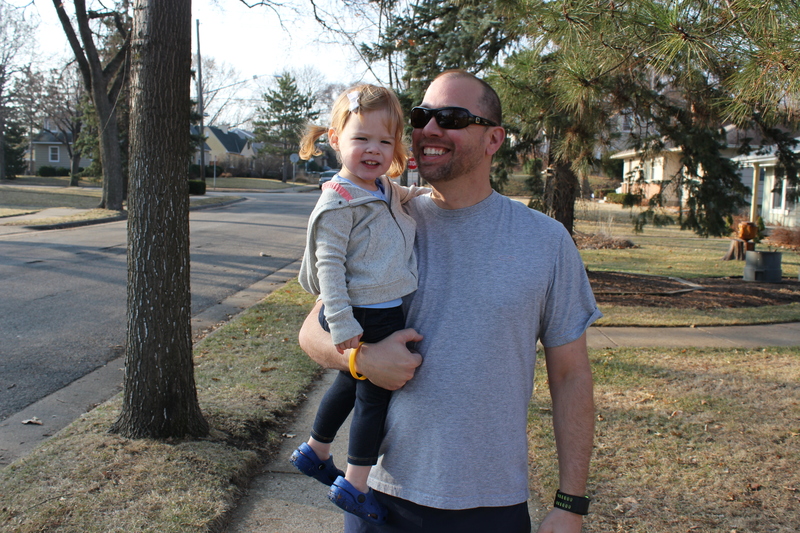 My kids–all of them–need me to be these three things. I have a good start on the loving part, but the bold and sensible–that’s going to take some real effort. The only thing I feel I can control is how I handle what is given to me, so this is where I am starting. No more freaking out over beeps in the hospital room or “what-ifs”. Those mentalities are, among other things, defeating and draining places to live. I’ve been doing that for nearly three weeks and I can’t do it any longer. I do, however, still have a fair amount of concern about Reece’s recovery, getting Britta back to Minneapolis and settled, and integrating a new baby into the family. I’m only human and I’m a Type A human at that. I should never do posts in the morning, because by the time they are up on the blog, the day has completely changed. I arrived at the hospital and Reece was back on BiPAP after a brief period of high-flow this morning. They were preparing to take him down for a CT scan. We haven’t received the official results from the radiologist. The doctors did review the scan and thought it looked maybe slightly more thick from junk in his lungs; there wasn’t anything obviously new. The doctors don’t feel that he is bleeding again, but likely fighting some sort of infection. They are not pushing for a bronchoscopy at this time, as it would most certainly mean intubation again, and would likely not change the course of treatment. He is still battling fevers and behaving in a similar manner as he would if we were at home and sick. He is somewhat chatty and responsive when he is awake, but he is sleeping a lot as well. It definitely requires more work from him to breath and he is noticeably uncomfortable, including whimpering when he is sleeping. Something is not right. It’s been an interesting couple of days. Reece’s personality has been coming back with some momentum. He has begun actually speaking in his normal style, versus giving one word requests and answers. He has wanted to play, he’s requested certain people, and he even willingly went on a wagon ride a couple of days ago. He has been eating some and drinking chocolate milk. What a guy! On the getting-Reece-back-to-his-normal-self front, things have greatly improved. Reece has been working through some lower grade fevers. Nothing has shot up too high and there have been many times where his temp has come back to normal on its own. Yesterday, however, he did struggle with breathing again and they put him back on BiPAP during the day (the day prior he had been on high flow for 12 hours/BiPAP for 12 hours), to give his lungs a rest. He made improvements throughout the day and apparently had good stats overnight. I hope it was just some extra rest that he needed after two very active days. His chest x-ray was reported as unchanged from the previous day, although I thought it looked a bit more murky. His lungs have not cleared entirely, which means he is either still fighting an infection or there is still some (likely old) blood in there. We’re praying for a good day for him today and improvements in breathing and fighting infections. I am going back to Normal Land and taking Britta to her two-year check-up this morning. She’s rocking and rolling, so I don’t have any concerns. She’s changed so much since this all transpired. Her vocabulary is amazing–she knows her colors, shapes, and has counted to 20 (with a little help)! Here’s a photo of her from last weekend. Reece’s birthday is tomorrow. I can’t believe he is turning 5! I will say that during this hospital stay, he seems much older to me than what he actually is. I’m not sure what that is all about other than a reflection of his patience and tolerance levels. I would have never imagined he would still be in the hospital for his birthday and yet I am happy that he has made it this far and hopeful and anxiously awaiting his return home when we can throw him a bigger celebration and he is feeling more like himself. Still, I ordered him a Lego cake and will be picking up some special things to celebrate the day. He is excited for it, too, as he has big smiles when he talks about it. What a special day it will be, no matter where we are celebrating. What do a former Army Special Forces soldier, a hard-core fitness ‘cult’, On-line Data Back-Up Services and a NW U.S. based coffee company have to do with each other? They have each donated product to my ‘Be the One Run’ fundraising efforts. GoRuck is a specialty bag making company making very cool product in Montana. The founder is a former Army Special Forces (Green Beret) soldier who recognized the value in military grade packs for civilian (and military) use. GoRuck has donated $150 work of product that will be given to a randomly selected donor on March 31. Please check out the GoRuck website, www.goruck.com , to learn more. Buy a hat or a bag or even sign up for a local GoRuck challenge if you have the nerve. On-line Data Back Up services provide an invaluable service for those of us who keep so much of our lives on our computers. Frontier Communications has a data back-up service, F-Secure, and has donated several gift cards that will provide a 3-month trial for this service. These cards are being awarded bi-weekly beginning on March 23. www.frontier.com for more information. And that classic American company that changed the way much of the world views coffee, Starbucks, donated a gift card that has already been given to a donor.